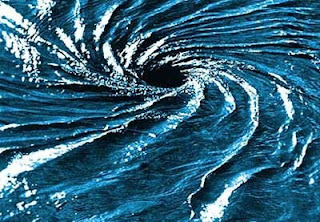 Terrence Deacon’s article, “Emergence: The Hole at the Wheel’s Hub,” helps bring some clarity to the compelling but poorly defined concept of emergence, which is often used to describe the spontaneous production of order. Deacon describes three hierarchical levels of emergence, and in so doing he provides important scientific context for the Eastern concept of co-dependent arising.The article echoes the previous piece by physicist Paul Davies, which places the origin of the laws of nature within the universe itself. “Emergence: The Hole at the Wheel’s Hub” appears in THE RE-EMERGENCE OF EMERGENCE: THE EMERGENTIST HYPOTHESIS FROM SCIENCE TO RELIGION, a book edited by Philip Clayton (see The Emergence of Spirit) and Paul Davies (Taking Science on Faith). Terrence Deacon is a professor of Biological Anthropology and Linguistics at UC Berkeley and is also the author of THE SYMBOLIC SPECIES: CO-EVOLUTION OF LANGUAGE AND THE BRAIN. This rich panoply of causes has been reduced to only one, efficient cause, in our scientific age. Renaissance thinkers such as Descartes and Spinoza took particular offense at the notion of final cause.Deacon says, “As exemplified by the early explanations of the power of vacuums and buoyancy, only 'pushes' [not pulls] seemed allowable as determinants of the efficacy and direction of physical changes." Deacon elaborates, "Here we are confronted with a different sense of causality, in the form of an 'affordance': a specifically constrained range of possibilities, a potential that is created by virtue of something missing." Deacon uses this notion of absence, of something being shaped by what is missing, to help unify three different progressively more complex levels of emergence. He calls them non-recurrent, simple recurrent and hyper recurrent, or alternatively, first, second, and third order emergence, or thermodynamic, morphodynamic and teleodynamic emergence. With first order, or thermodynamic emergence, higher-order properties emerge from aggregates, for example liquid phenomena—such as surface tension and laminar or turbulent flow—characteristic of water molecules. Numbers matter to emergent properties, in contrast to other molecular properties, such as atomic composition and mass, which are invariant across scale.A single water molecule is not a liquid; liquid properties are due to the relationships between molecules. In repeated interactions, the characteristics of individual water molecules, for example their charge or internal vibration, distribute so as to cancel each other.This leaves only relational properties, or how molecules fit together, which are non-canceling, to characterize the aggregate. Liquid properties are new properties that emerge from the aggregate, even though they can be described in reductive terms. Many different types of molecules can amass into liquids. There are "... many possible ways that different micro-details of structure and interaction can converge to produce the same higher-order properties. A given higher-order liquid property 'supervenes' on specific lower-order interactions to the extent that the former always entails the latter, but the vast iterative dynamics of these interactions also has a variety-canceling effect that converges to similar results across a wide range of substrates and modes of interaction." In thermodynamic emergence, the uniformity of the higher order properties leaves no way for biases—or non-canceling regularities—to reinforce complementary biases at lower levels. In contrast in self-organizing, or morphodynamic systems, “…interaction dynamics at lower levels becomes strongly affected by regularities emerging at higher levels of organization.” Thermodynamic emergence becomes unstable; with continuing perturbations, these biases at higher levels can come to overwhelm cancellation. In Bernard cells, for example, water of uniform depth heated from below, under certain conditions, forms regular hexagonal cells of rising hot and falling cool liquid. This bias or higher-level regularity comes about because various other “unstable patterns of convection cancel each other out.” Regular hexagonal cells allow for the most efficient dissipation of heat. Benard cell dynamics. Left: A tracing of a photo of Benard cells forming in a heated dish, showing their approximate hexagonal symmetry (though distorted by the constraints of the circular edge of the dish). Right: A diagram of the convection current pattern for a single Benard cell in stable dynamical configuration. In each of these examples of second-order emergent phenomena, "we find a tangled hierarchy of causality, where micro-configurational particularities can be amplified to determine macro-configurational regularities and where these in turn further constrain and/or amplify subsequent micro-configurational regularities. … As material and energy flows in, through and out again, form also re-circulates and becomes amplified. In one sense this form is nothing more than a set of restrictions upon and biases towards possible future material and energetic events; in another sense, it is what defines and bounds the higher-order unity that we identify as the system." In third order emergent systems, in addition to the above, some sort of informational memory is present. "...[N]ot only is there an amplification of the global influences on parts, but also a redundant 'sampling' of these influences which reintroduces them into different realizations of the system over time.” Memory, in the form of genetic material, for example, allows third order emergent systems to enclose morphodynamic systems in another causal loop. This memory or historical encoding means that new forms can now be maintained across chasms of time, space, and energy. Such systems are inherently developmental and/or evolutionary. "…[N]atural selection can be seen as a random or stochastic 'exploration' of variant morphodynamic relationships of reciprocity with respect to environmental regularities." "...[B]ecause there is a remembered trace of each prior 'self' state contributing to the dynamics of future states, such systems develop not merely with respect to the immediate prior state of the whole, but also with respect to their own remembered past states. This contributes to the characteristic differentiation and divergence from, and the convergence back towards, some 'reference' state, which organisms standardly exhibit." This purpose at the center of third order emergence—movement towards some target state by competitive reproductive success—justifies calling these “teleodynamic systems.” Yet this purpose is also a specific absence, just as the void that forms the vessel in the Taoist verse earlier. It echoes and builds on the specific absence in the other two kinds of emergence as well. Each develops around what Deacon calls the least-discordant remainder. Future events are shaped less by determinism than by "what was not cancelled or eliminated.” This leads to an apparent time reversal in the sense that what is not there, the "pull of yet unrealized possibility," becomes efficacious. This pull of unrealized possibility comes to determine "function in biology and purposeful action in psychology.” It is also “the essence of representation, or intentionality: something whose existence is conditional upon something that is not. It is this feature of mental phenomena that has most mystified scholars for millennia: their 'aboutness.’"
These causal topologies also help redefine three of Aristotle's causes and interconnect them. Teleodynamic emergence roughly corresponds to final causality. It encircles morphodynamics emergence, which in some sense corresponds to formal causality, which in turn encircles thermodynamic or efficient causality. At the pinnacle of these causalities rests human consciousness and the subjective experience of self. Deacon writes, “A symbolizing mind has perhaps the widest possible locus of causal influence of anything on earth. …Human consciousness—with its features of autonomous causal locus, self-origination, and implicit 'aboutness’—epitomizes the logic of emergence in its very form. Like something coming out of nothing, the subjective self is, in effect, a constitutive absence for the sake of which new constitutive absence is being incessantly evolved. In this sense, there is some legitimacy to the eliminativist claim that there is no 'thing' that it is. Indeed this must be so. The locus of self is, effectively, a negative mode of existence that can act as an unmoved mover of sorts, a non-thing that nonetheless is the locus of a form of inertia—a resistance to change—with respect to which other physical processes can be recruited and organize." Have you seen a bullock-cart moving? The wheel moves, goes on moving, but at the center of the wheel something remains permanent. On that permanent hub the wheel moves. On that unmoving hub the wheel's movement exists. Exactly like that, you have a hub -- that hub is unmoving; and you have a wheel-like personality that goes on moving. You have travelled far, thousands of miles and thousands of lives, and the wheel knows many roads and many paths, but the hub has remained where it is. Now you can look at reality in two ways: either from the wheel -- then everything is changing every moment; or from the hub -- then nothing is changing. feedback in an emergent process that appears to incorporate purpose. "With third order emergence, purpose emerges. Third order emergent systems and the atoms that compose them "do something for something." Their purpose is forged by their emergent history." discovery in scripture like evolution, string theory, black holes and universe creation, found respectively in Jewish, Islamic and Hindu scripture. Are you aware of any comprehensive study along such lines and would you consider it to be a topic for your blog?